Can you confirm these amateur observations of Pantherophis vulpinus? Type locality [gloydi]: Little Cedar Point, Jerusalem Township, Lucas County, Ohio. Types Neotype: USNM 9969, designated by Conant, from Racine, Wisconsin; original holotype (USNM 1624) lost. Diagnosis Diagnosis (Mintonius) = Description: As given for the type species in Baird and Girard (1853: 75-76), but also defined phylogenetically by Burbrink and Lawson (2007). Additionally, Mintonius differs from its most closely related genera (Pantherophis, Pituophis, and Scotophis) by aspects of its scutellation (smooth laterally and keeled on the back [juveniles smooth throughout], 2 postoculars, 1 preocular, 8 supralabials [rarely 7 or 9, and with the 4th and 5th touching the eye], 10-12 infralabials, 23-25 dorsal scale rows at mid body [rarely 27]), and color pattern (reddish-brown to dark brown blotches over a yellowish-grey to yellowish-brown ground color along the body. The head is conspicuously off-colored from the body, ranging from copper-red to light brown. The belly is yellowish overall with well-defined dark (black to brown) rectangular blotches. Mintonius differs further by morphology in having a large stout body, a short tail (15% of total length), a head slightly set off from the body, and a snout that is rounded [from COLLINS & TAGGART 2008]. 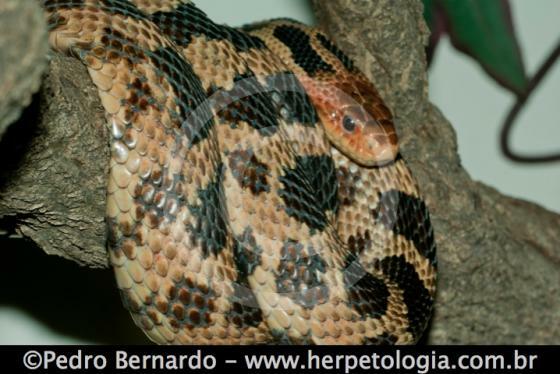 Diagnosis: Pantherophis vulpinus is diagnosed by the number and size of its dorsal body blotches (33 to 51; mean = 40.9) and smaller sized blotches (3-4 scales in length) while specimens of P. gloydi possess a lower count (28–39; mean = 34.5) and larger blotch size (4–6 scales in length). The number of tail blotches, maximum length, and scale counts have also been noted as minor, yet distinctive characteristics distinguishing the two lineages [CONANT 1940]. 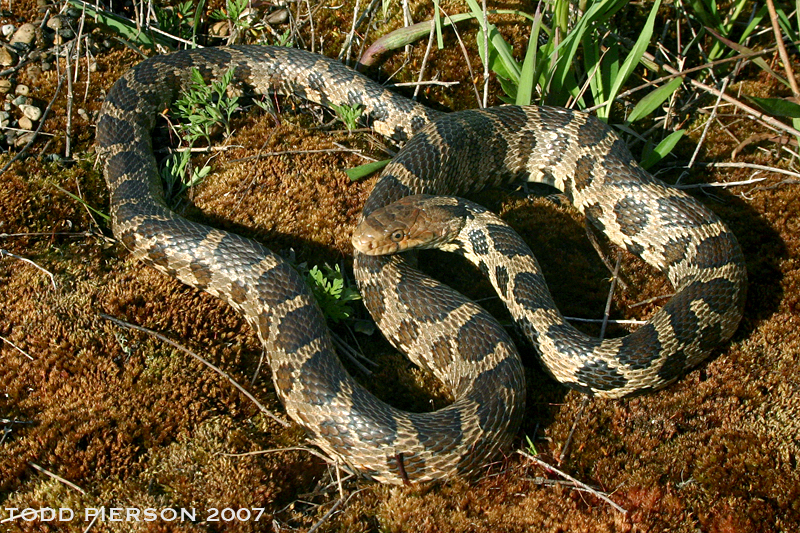 Comment Synonymy: Elaphe vulpina gloydi has been synonymized with P. vulpinus by CROTHER et al. 2011. 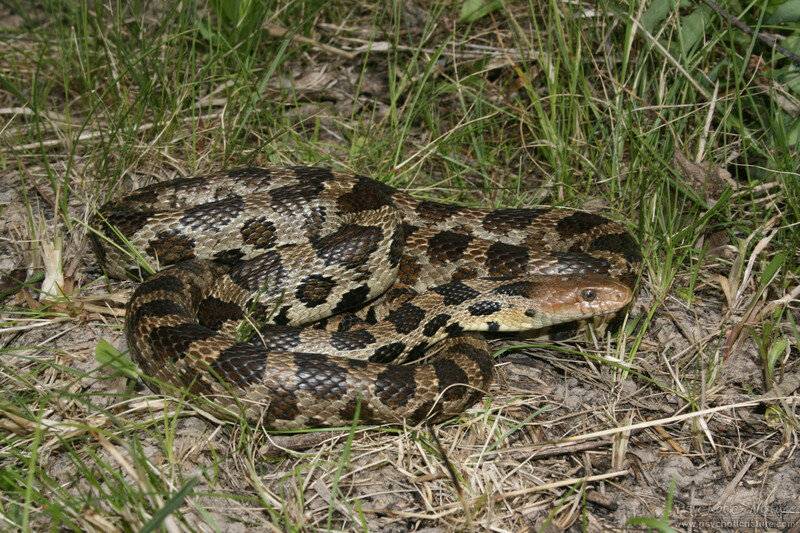 Hybridization: Pituophis catenifer sayi × Pantherophis vulpinus hybridize in nature. Type species: Scotophis vulpinus BAIRD & GIRARD 1853 is the type species of the genus Mintonius COLLINS & TAGGART 2008. 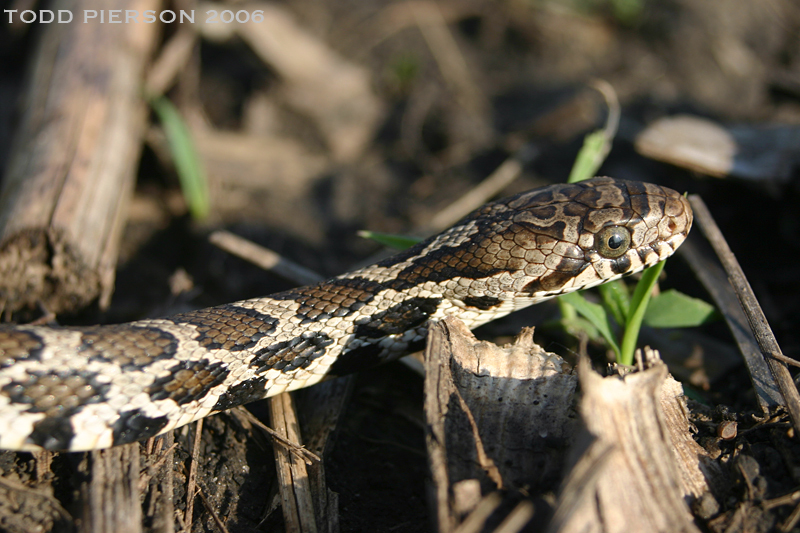 PYRON & BURBRINK (2009) consider Mintonius as a synonym of Pantherophis. Wynn, D.E. & Moody, S.M. 2006. Ohio Turtle, Lizard, and Snake Atlas. Ohio Biological Survey, 80 pp.